This article is about a nation and an ethnic group. For information on the population of England, see Demography of England. For other uses, see English (disambiguation) and Englishman (disambiguation). "Englanders" redirects here. It is not to be confused with the term Little Englander. Traditionally Anglicanism, but also non-conformists and dissenters (see History of the Church of England), as well as other Protestants; also Roman Catholics (see Catholic Emancipation); Islam (see Islam in England); Judaism and other faiths (see Religion in England). Almost 25% are non-religious. The English people are a nation and an ethnic group native to England who speak the English language. The English identity is of early medieval origin, when they were known in Old English as the Angelcynn ("family of the Angles"). Their ethnonym is derived from the Angles, one of the Germanic peoples who migrated to Great Britain around the 5th century AD. England is one of the countries of the United Kingdom, and the majority of people living there are British citizens. 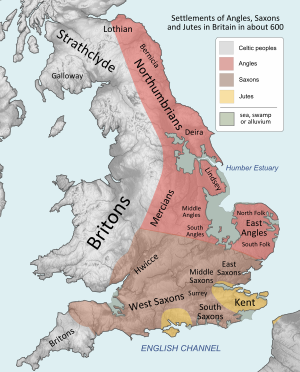 The English largely descend from two main historical population groups – the earlier Celtic Britons (or Brythons) and the Germanic tribes who settled in Britain following the withdrawal of the Romans: the Angles, Saxons, Jutes and Frisians. Collectively known as the Anglo-Saxons, they founded what was to become the Kingdom of England (from the Old English Englaland) by the early 10th century, in response to the invasion and minor settlement of Danes beginning in the late 9th century. This was followed by the Norman Conquest and limited settlement of Anglo-Normans in England in the latter 11th century. In the Acts of Union 1707, the Kingdom of England was succeeded by the Kingdom of Great Britain. Over the years, English customs and identity have become fairly closely aligned with British customs and identity in general. Today many English people have recent forebears from other parts of the United Kingdom, while some are also descended from more recent immigrants from other European countries and from the Commonwealth. The English people are the source of the English language, the Westminster system, the common law system and numerous major sports such as cricket, football, rugby union, rugby league and tennis. These and other English cultural characteristics have spread worldwide, in part as a result of the former British Empire. 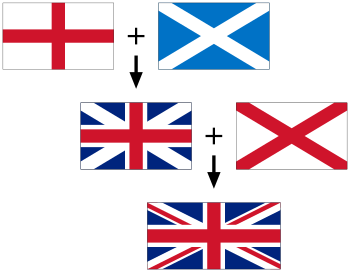 The concept of an 'English nation' (as opposed to a British one) has become increasingly popular after the devolution process in Scotland, Wales and Northern Ireland resulted in the four nations having semi-independent political and legal systems. Although England itself has no devolved government, the 1990s witnessed a rise in English self-consciousness. This is linked to the expressions of national self-awareness of the other British nations of Wales and Scotland – which take their most solid form in the new devolved political arrangements within the United Kingdom – and the waning of a shared British national identity with the growing distance between the end of the British Empire and the present. Many recent immigrants to England have assumed a solely British identity, while others have developed dual or mixed identities. Use of the word "English" to describe Britons from ethnic minorities in England is complicated by most non-white people in England identifying as British rather than English. In their 2004 Annual Population Survey, the Office for National Statistics compared the ethnic identities of British people with their perceived national identity. They found that while 58% of white people in England described their nationality as "English", the vast majority of non-white people called themselves "British". It is unclear how many British people consider themselves English. In the 2001 UK census, respondents were invited to state their ethnicity, but while there were tick boxes for 'Irish' and for 'Scottish', there were none for 'English', or 'Welsh', who were subsumed into the general heading 'White British'. Following complaints about this, the 2011 census was changed to "allow respondents to record their English, Welsh, Scottish, Northern Irish, Irish or other identity." Another complication in defining the English is a common tendency for the words "English" and "British" to be used interchangeably, especially outside the UK. In his study of English identity, Krishan Kumar describes a common slip of the tongue in which people say "English, I mean British". He notes that this slip is normally made only by the English themselves and by foreigners: "Non-English members of the United Kingdom rarely say 'British' when they mean 'English'". Kumar suggests that although this blurring is a sign of England's dominant position with the UK, it is also "problematic for the English [...] when it comes to conceiving of their national identity. It tells of the difficulty that most English people have of distinguishing themselves, in a collective way, from the other inhabitants of the British Isles". "When the Oxford History of England was launched a generation ago, "England" was still an all-embracing word. It meant indiscriminately England and Wales; Great Britain; the United Kingdom; and even the British Empire. Foreigners used it as the name of a Great Power and indeed continue to do so. Bonar Law, by origin a Scotch Canadian, was not ashamed to describe himself as "Prime Minister of England" [...] Now terms have become more rigorous. The use of "England" except for a geographic area brings protests, especially from the Scotch." However, although Taylor believed this blurring effect was dying out, in his book The Isles (1999), Norman Davies lists numerous examples in history books of "British" still being used to mean "English" and vice versa. In December 2010, Matthew Parris in The Spectator, analysing the use of "English" over "British", argued that English identity, rather than growing, had existed all along but has recently been unmasked from behind a veneer of Britishness. David Reich's laboratory found that 90% of Britain's Neolithic gene pool was overturned by a population from North Continental Europe characterized by the Bell Beaker culture around 1200BC who carried a large amount of Yamnaya ancestry from the Pontic-Caspian Steppe, including the R1b Haplogroup. This population lacked genetic affinity to other Bell Beaker populations, such as the Iberian Bell Beakers, but appeared to be an offshoot of the Corded Ware single grave people. It is currently unknown whether these Beakers would go on to develop Celtic languages in the British Isles or if later Celtic Migrations introduced Celtic languages to Britain. There is a debate between historians, geneticists and others about the extent to which historical changes in the culture of the British Isles corresponds to historical migration events of Germanic tribes, and to the extent of these migrations. During this period the language and culture of most of what became England changed from Romano-British to Germanic. The Germanic-speakers in Britain, themselves of diverse origins, eventually developed a common cultural identity as Anglo-Saxons. This process occurred from the mid-fifth to early seventh centuries, following the end of Roman power in Britain around the year 410. The settlement was followed by the establishment of Anglo-Saxon kingdoms in the south and east of Britain, later followed by the rest of modern England. The available evidence includes the scanty contemporary and near-contemporary written record, and archaeological and genetic information. [a] The few literary sources tell of hostility between incomers and natives. They describe violence, destruction, massacre and the flight of the Romano-British population. Moreover, there is little clear evidence for the influence of British Celtic or British Latin on Old English. These factors have suggested a very large-scale invasion by various Germanic peoples. In this view, held by the majority of historians until the mid to late twentieth century, much of what is now England was cleared of its prior inhabitants. If this traditional viewpoint were to be correct, the genes of the later English people would have been overwhelmingly inherited from Germanic migrants. However, another view, probably the most widely held today, is that the migrants were fewer, possibly centred on a warrior elite. This hypothesis suggests that the incomers, having achieved a position of political and social dominance, initiated a process of acculturation by the natives to their language and material culture, and intermarrying with them to a significant degree. Archaeologists have found that settlement patterns and land-use show no clear break with the Romano-British past, though there are marked changes in place names and material culture. This view predicts that the ancestry of the people of Anglo-Saxon and modern England would be largely derived from the native Romano-British. The uncertain results of genetic studies have tended to support both a predominant amount of native British Celtic ancestry, as well as a significant contribution from Anglo-Saxon migrations. Even so, if these incomers established themselves as a social elite, this could have allowed them enhanced reproductive success (the so-called 'Apartheid Theory'). In this case, the prevalent genes of later Anglo-Saxon England could have been largely derived from moderate numbers of Germanic migrants. This theory, originating in a population genetics study, has proven controversial, and has been critically received by a number of scholars. The first people to be called 'English' were the Anglo-Saxons, a group of closely related Germanic tribes that began migrating to eastern and southern Great Britain, from southern Denmark and northern Germany, in the 5th century AD, after the Romans had withdrawn from Britain. The Anglo-Saxons gave their name to England (Engla land, meaning "Land of the Angles") and to the English. The Anglo-Saxons arrived in a land that was already populated by people commonly referred to as the 'Romano-British'—the descendants of the native Brythonic-speaking population that lived in the area of Britain under Roman rule during the 1st–5th centuries AD. The multi-ethnic nature of the Roman Empire meant that small numbers of other peoples may have also been present in England before the Anglo-Saxons arrived. There is archaeological evidence, for example, of an early North African presence in a Roman garrison at Aballava, now Burgh-by-Sands, in Cumbria: a 4th-century inscription says that the Roman military unit Numerus Maurorum Aurelianorum ("unit of Aurelian Moors") from Mauretania (Morocco) was stationed there. Although the Roman Empire incorporated peoples from far and wide, genetic studies suggest the Romans did not significantly mix into the British population. The exact nature of the arrival of the Anglo-Saxons and their relationship with the Romano-British is a matter of debate. Traditionally, it was believed that a mass invasion by various Anglo-Saxon tribes largely displaced the indigenous British population in southern and eastern Great Britain (modern-day England with the exception of Cornwall). This was supported by the writings of Gildas, the only contemporary historical account of the period, describing slaughter and starvation of native Britons by invading tribes (aduentus Saxonum). Furthermore, the English language contains no more than a handful of words borrowed from Brythonic sources. However, this view has been re-evaluated by some archaeologists and historians since the 1960s; and more recently supported by genetic studies, which see only minimal evidence for mass displacement. Archaeologist Francis Pryor has stated that he "can't see any evidence for bona fide mass migrations after the Neolithic." While the historian Malcolm Todd writes "It is much more likely that a large proportion of the British population remained in place and was progressively dominated by a Germanic aristocracy, in some cases marrying into it and leaving Celtic names in the, admittedly very dubious, early lists of Anglo-Saxon dynasties. But how we identify the surviving Britons in areas of predominantly Anglo-Saxon settlement, either archaeologically or linguistically, is still one of the deepest problems of early English history." In a survey of the genes of British and Irish men, even those British regions that were most genetically similar to (Germanic speaking) continental regions were still more genetically British than continental: "When included in the PC analysis, the Frisians were more 'Continental' than any of the British samples, although they were somewhat closer to the British ones than the North German/Denmark sample. For example, the part of mainland Britain that has the most Continental input is Central England, but even here the AMH+1 frequency, not below 44% (Southwell), is higher than the 35% observed in the Frisians. These results demonstrate that even with the choice of Frisians as a source for the Anglo-Saxons, there is a clear indication of a continuing indigenous component in the English paternal genetic makeup." In 2016, through the investigation of burials using ancient DNA techniques, researchers found evidence of intermarriage in the earliest phase of Anglo-Saxon settlement. By studying rare mutations and employing whole genome sequencing, it was claimed that the continental and insular origins of the ancient remains could be discriminated, and it was calculated that 25–40% of the ancestry of the modern English is attributable to continental 'Anglo-Saxon' origins. From about 800 AD waves of Danish Viking assaults on the coastlines of the British Isles were gradually followed by a succession of Danish settlers in England. At first, the Vikings were very much considered a separate people from the English. This separation was enshrined when Alfred the Great signed the Treaty of Alfred and Guthrum to establish the Danelaw, a division of England between English and Danish rule, with the Danes occupying northern and eastern England. However, Alfred's successors subsequently won military victories against the Danes, incorporating much of the Danelaw into the nascent kingdom of England. Danish invasions continued into the 11th century, and there were both English and Danish kings in the period following the unification of England (for example, Æthelred II (978–1013 and 1014–1016) was English but Cnut (1016–1035) was Danish). Gradually, the Danes in England came to be seen as 'English'. They had a noticeable impact on the English language: many English words, such as anger, ball, egg, got, knife, take, and they, are of Old Norse origin, and place names that end in -thwaite and -by are Scandinavian in origin. Southern Great Britain in AD 600 after the Anglo-Saxon settlement, showing England's division into multiple petty kingdoms. The English population was not politically unified until the 10th century. Before then, it consisted of a number of petty kingdoms which gradually coalesced into a Heptarchy of seven powerful states, the most powerful of which were Mercia and Wessex. The English nation state began to form when the Anglo-Saxon kingdoms united against Danish Viking invasions, which began around 800 AD. Over the following century and a half England was for the most part a politically unified entity, and remained permanently so after 959. The nation of England was formed in 937 by Æthelstan of Wessex after the Battle of Brunanburh, as Wessex grew from a relatively small kingdom in the South West to become the founder of the Kingdom of the English, incorporating all Anglo-Saxon kingdoms and the Danelaw. The Norman conquest of England during 1066 brought Anglo-Saxon and Danish rule of England to an end, as the new French speaking Norman elite almost universally replaced the Anglo-Saxon aristocracy and church leaders. After the conquest, "English" normally included all natives of England, whether they were of Anglo-Saxon, Scandinavian or Celtic ancestry, to distinguish them from the Norman invaders, who were regarded as "Norman" even if born in England, for a generation or two after the Conquest. The Norman dynasty ruled England for 87 years until the death of King Stephen in 1154, when the succession passed to Henry II, House of Plantagenet (based in France), and England became part of the Angevin Empire until 1399. Various contemporary sources suggest that within 50 years of the invasion most of the Normans outside the royal court had switched to English, with Anglo-Norman remaining the prestige language of government and law largely out of social inertia. For example, Orderic Vitalis, a historian born in 1075 and the son of a Norman knight, said that he learned French only as a second language. Anglo-Norman continued to be used by the Plantagenet kings until Edward I came to the throne. Over time the English language became more important even in the court, and the Normans were gradually assimilated, until, by the 14th century, both rulers and subjects regarded themselves as English and spoke the English language. Despite the assimilation of the Normans, the distinction between 'English' and 'French' survived in official documents long after it had fallen out of common use, in particular in the legal phrase Presentment of Englishry (a rule by which a hundred had to prove an unidentified murdered body found on their soil to be that of an Englishman, rather than a Norman, if they wanted to avoid a fine). This law was abolished in 1340. Since the 18th century, England has been one part of a wider political entity covering all or part of the British Isles, which today is called the United Kingdom. Wales was annexed by England by the Laws in Wales Acts 1535–1542, which incorporated Wales into the English state. A new British identity was subsequently developed when James VI of Scotland became James I of England as well, and expressed the desire to be known as the monarch of Britain. In 1707, England formed a union with Scotland by passing an Act of Union in March 1707 that ratified the Treaty of Union. The Parliament of Scotland had previously passed its own Act of Union, so the Kingdom of Great Britain was born on 1 May 1707. In 1801, another Act of Union formed a union between the Kingdom of Great Britain and the Kingdom of Ireland, creating the United Kingdom of Great Britain and Ireland. In 1922, about two-thirds of the Irish population (those who lived in 26 of the 32 counties of Ireland), left the United Kingdom to form the Irish Free State. The remainder became the United Kingdom of Great Britain and Northern Ireland, although this name was not introduced until 1927, after some years in which the term "United Kingdom" had been little used. Throughout the history of the UK, the English have been dominant in population and in political weight. As a consequence, notions of 'Englishness' and 'Britishness' are often very similar. At the same time, after the Union of 1707, the English, along with the other peoples of the British Isles, have been encouraged to think of themselves as British rather than to identify themselves with the constituent nations. England has been the destination of varied numbers of migrants at different periods from the 17th century onwards. While some members of these groups seek to practise a form of pluralism, attempting to maintain a separate ethnic identity, others have assimilated and intermarried with the English. Since Oliver Cromwell's resettlement of the Jews in 1656, there have been waves of Jewish immigration from Russia in the 19th century and from Germany in the 20th. After the French king Louis XIV declared Protestantism illegal in 1685 in the Edict of Fontainebleau, an estimated 50,000 Protestant Huguenots fled to England. Due to sustained and sometimes mass emigration of the Irish, current estimates indicate that around 6 million people in the UK have at least one grandparent born in the Republic of Ireland. There has been a black presence in England since the 16th century due to the slave trade, and an Indian presence since at least the 17th century because of the East India Company and British Raj. Black and Asian populations have grown throughout the UK generally, as immigration from the British Empire and the subsequent Commonwealth of Nations was encouraged due to labour shortages during post-war rebuilding. However, these groups are often still considered to be ethnic minorities and research has shown that black and Asian people in the UK are more likely to identify as British rather than with one of the state's four constituent nations, including England. The 1990s witnessed a resurgence of English national identity. 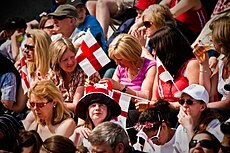 Survey data shows a rise in the number of people in England describing their national identity as English and a fall in the number describing themselves as British. Today, black and minority ethnic people of England still generally identify as British rather than English to a greater extent than their white counterparts; however, groups such as the Campaign for an English Parliament (CEP) suggest the emergence of a broader civic and multi-ethnic English nationhood. Scholars and journalists have noted a rise in English self-consciousness, with increased use of the English flag, particularly at football matches where the Union flag was previously more commonly flown by fans. This perceived rise in English self-consciousness has generally been attributed to the devolution in the late 1990s of some powers to the Scottish Parliament and National Assembly for Wales. In policy areas for which the devolved administrations in Scotland, Wales and Northern Ireland have responsibility, the UK Parliament votes on laws that consequently only apply to England. Because the Westminster Parliament is composed of MPs from throughout the United Kingdom, this has given rise to the "West Lothian question", a reference to the situation in which MPs representing constituencies outside England can vote on matters affecting only England, but MPs cannot vote on the same matters in relation to the other parts of the UK. Consequently, groups such as the CEP have called for the creation of a devolved English Parliament, claiming that there is now a discriminatory democratic deficit against the English. The establishment of an English parliament has also been backed by a number of Scottish and Welsh nationalists. Writer Paul Johnson has suggested that like most dominant groups, the English have only demonstrated interest in their ethnic self-definition when they were feeling oppressed. John Curtice argues that "In the early years of devolution...there was little sign" of an English backlash against devolution for Scotland and Wales, but that more recently survey data shows tentative signs of "a form of English nationalism...beginning to emerge among the general public". Michael Kenny, Richard English and Richard Hayton, meanwhile, argue that the resurgence in English nationalism predates devolution, being observable in the early 1990s, but that this resurgence does not necessarily have negative implications for the perception of the UK as a political union. Others question whether devolution has led to a rise in English national identity at all, arguing that survey data fails to portray the complex nature of national identities, with many people considering themselves both English and British. Recent surveys of public opinion on the establishment of an English parliament have given widely varying conclusions. In the first five years of devolution for Scotland and Wales, support in England for the establishment of an English parliament was low at between 16 and 19%, according to successive British Social Attitudes Surveys. A report, also based on the British Social Attitudes Survey, published in December 2010 suggests that only 29% of people in England support the establishment of an English parliament, though this figure had risen from 17% in 2007. One 2007 poll carried out for BBC Newsnight, however, found that 61 per cent would support such a parliament being established. Krishan Kumar notes that support for measures to ensure that only English MPs can vote on legislation that applies only to England is generally higher than that for the establishment of an English parliament, although support for both varies depending on the timing of the opinion poll and the wording of the question. Electoral support for English nationalist parties is also low, even though there is public support for many of the policies they espouse. The English Democrats gained just 64,826 votes in the 2010 UK general election, accounting for 0.3 per cent of all votes cast in England. Kumar argued in 2010 that "despite devolution and occasional bursts of English nationalism – more an expression of exasperation with the Scots or Northern Irish – the English remain on the whole satisfied with current constitutional arrangements". From the earliest times English people have left England to settle in other parts of Great Britain and Northern Ireland, but it is not possible to identify their numbers, as British censuses have historically not invited respondents to identify themselves as English. However, the census does record place of birth, revealing that 8.08% of Scotland's population, 3.66% of the population of Northern Ireland and 20% of the Welsh population were born in England. Similarly, the census of the Republic of Ireland does not collect information on ethnicity, but it does record that there are over 200,000 people living in Ireland who were born in England and Wales. English ethnic descent and emigrant communities are found primarily in the Western World, and in some places, settled in significant numbers. Substantial populations descended from English colonists and immigrants exist in the United States, Canada, Australia, South Africa and New Zealand. In the 2016 American Community Survey, English Americans were (7.4%) of the United States population behind the German Americans (13.9%) and Irish Americans (10.0%). However, demographers regard this as a serious undercount, as the index of inconsistency is high, and many, if not most, people from English stock have a tendency (since the introduction of a new 'American' category in the 2000 census) to identify as simply Americans or if of mixed European ancestry, identify with a more recent and differentiated ethnic group. In the 2000 census, 24,509,692 Americans described their ancestry as wholly or partly English. In addition, 1,035,133 recorded British ancestry. This was a numerical decrease from the census in 1990 where 32,651,788 people or 13.1% of the population self-identified with English ancestry. In the 1980 census, over 49 million (49,598,035) Americans claimed English ancestry, at the time around 26.34% of the total population and largest reported group which, even today, would make them the largest ethnic group in the United States. Scots-Irish Americans are descendants of Lowland Scots and Northern English (specifically: County Durham, Cumberland, Northumberland and Westmorland) settlers who colonised Ireland during the Plantation of Ulster in the 17th century. Americans of English heritage are often seen, and identify, as simply "American" due to the many historic cultural ties between England and the U.S. and their influence on the country's population. Relative to ethnic groups of other European origins, this may be due to the early establishment of English settlements; as well as to non-English groups having emigrated in order to establish significant communities. In the Canada 2016 Census, 'English' was the most common ethnic origin (ethnic origin refers to the ethnic or cultural group(s) to which the respondent's ancestors belong) recorded by respondents; 6,320,085 people or 18.3% of the population self-identified themselves as wholly or partly English. On the other hand, people identifying as Canadian but not English may have previously identified as English before the option of identifying as Canadian was available. Edmund Barton and Alfred Deakin, 1st and 2nd Prime Minister of Australia both had English parents. From the beginning of the colonial era until the mid-20th century, the vast majority of settlers to Australia were from the British Isles, with the English being the dominant group. Among the leading ancestries, increases in Australian, Irish and German ancestries and decreases in English, Scottish and Welsh ancestries appear to reflect such shifts in perception or reporting. These reporting shifts at least partly resulted from changes in the design of the census question, in particular the introduction of a tick box format in 2001. English Australians have more often come from the south than the north of England. Australians of English descent, are both the single largest ethnic group in Australia and the largest 'ancestry' identity in the Australian census. In the 2016 census, 7.8 million or 36.1% of the population identified as "English" or a combination including English, a numerical increase from 7.2 million over the 2011 census figure. The census also documented 907,572 residents or 3.9% of Australia as being born in England, and are the largest overseas-born population. From 1840, the English comprised the largest single group among New Zealand’s overseas-born, consistently being over 50 percent of the total population. Despite this, after the early 1850s the English-born slowly fell from being a majority of the colonial population. In the 1851 census 50.5% of the total population were born in England, this proportion fell to 36.5% (1861) and 24.3% by 1881. In the most recent Census in 2013, there were 215,589 English-born representing 21.5% of all overseas-born residents or 5 percent of the total population and is still the most-common birthplace outside New Zealand. Significant numbers of people with at least some English ancestry also live in South Africa and South America. The culture of England is sometimes difficult to separate clearly from the culture of the United Kingdom, so influential has English culture been on the cultures of the British Isles and, on the other hand, given the extent to which other cultures have influenced life in England. English people traditionally speak the English language, a member of the West Germanic language family, first spoken in early medieval England. It is closely related to the Frisian languages, but its vocabulary has been significantly influenced by other Germanic languages, particularly Norse (a North Germanic language), as well as by Latin and French. The three largest recognisable dialect groups in England are Southern English dialects, Midlands English dialects and Northern English dialects. Those in the north generally pronounce such words with a short vowel whereas those in the south use a long vowel. The established religion of the realm is the Church of England, whose Titular head is Queen Elizabeth II although the worldwide Anglican Communion is overseen by the General Synod of its bishops under the authority of Parliament. 26 of the church's 42 bishops are Lords Spiritual, representing the church in the House of Lords. In 2010, the Church of England counted 25 million baptised members out of the 41 million Christians in Great Britain's population of about 60 million; around the same time, it also claimed to baptise one in eight newborn children. Generally, anyone in England may marry or be buried at their local parish church, whether or not they have been baptised in the church. Actual attendance has declined steadily since 1890, with around one million, or 10% of the baptised population attending Sunday services on a regular basis (defined as once a month or more) and three million- roughly 15%- joining Christmas Eve and Christmas services. A crowd celebrates Saint George's Day at an event in Trafalgar Square in 2010. Saint George is recognised as the patron saint of England and the flag of England consists of his cross. Prior to Edward III, the patron saint was St Edmund and St Alban is also honoured as England's first martyr. A survey carried out in the end of 2008 by Ipsos MORI on behalf of The Catholic Agency For Overseas Development found the population of England and Wales to be 47.0% affiliated with the Church of England, which is also the state church, 9.6% with the Roman Catholic Church and 8.7% were other Christians, mainly Free church Protestants and Eastern Orthodox Christians. 4.8% were Muslim, 3.4% were members of other religions, 5.3% were Agnostics, 6.8% were Atheists and 15.0% were not sure about their religious affiliation or refused to answer to the question. ^ The 2011 England and Wales census reports that in England and Wales 32.4 million people associated themselves with an English identity alone and 37.6 million identified themselves with an English identity either on its own or combined with other identities, being 57.7% and 67.1% respectively of the population of England and Wales. ^ Bureau, U.S. Census. "American FactFinder - Results". Factfinder2.census.gov. Retrieved 21 August 2017. ^ (Ancestry) The 2011 Australian Census reports 7,238,500 people of English ancestry. ^ (Ethnic origin) The 2006 Canadian Census gives 1,367,125 respondents stating their ethnic origin as English as a single response, and 5,202,890 including multiple responses, giving a combined total of 6,570,015. ^ (Ethnic origin) The 2006 New Zealand census Archived 19 February 2008 at the Wayback Machine reports 44,202 people (based on pre-assigned ethnic categories) stating they belong to the English ethnic group. The 1996 census used a different question Archived 19 February 2008 at the Wayback Machine to both the 1991 and the 2001 censuses, which had "a tendency for respondents to answer the 1996 question on the basis of ancestry (or descent) rather than 'ethnicity' (or cultural affiliation)" and reported 281,895 people with English origins; See also the figures for 'New Zealand European'. ^ "2011 Census: KS209EW Religion, local authorities in England and Wales". ons.gov.uk. 2010-07-02. Retrieved 15 December 2012. ^ "Online Etymology Dictionary". Etymonline.com. Retrieved 8 July 2011. ^ "Act of Union 1707". parliament.uk. Archived from the original on 21 September 2010. Retrieved 26 August 2010. ^ "The FA: 1863 - 2013". The Football Association. ^ Kumar 2003, pp. 1–18. ^ Condor, Gibson & Abell 2006. ^ Philip Johnston, "Tory MP leads English protest over census", The Daily Telegraph (London) 15 June 2006. ^ 'Developing the Questionnaires', National Statistics Office. ^ Kumar 2003, pp. 1–2. ^ Matthew Parris, in The Spectator dated 18 December 2010: "With a shrug of the shoulders, England is becoming a nation once again". ^ Novembre, John; Johnson, Toby; Bryc, Katarzyna; Kutalik, Zoltán; Boyko, Adam R.; Auton, Adam; Indap, Amit; King, Karen S.; Bergmann, Sven; Nelson, Matthew R.; Stephens, Matthew; Bustamante, Carlos D. (2008). "Genes mirror geography within Europe". Nature. 456 (7218): 98–101. doi:10.1038/nature07331. PMC 2735096. PMID 18758442. ^ "Dutch Beakers: Like no other Beakers". 2019-01-19. ^ Rincon, Paul (2018-02-21). "Ancient Britons 'replaced' by newcomers". BBC News. ^ Athanasiadis, G.; Cheng, J. Y.; Vilhjalmsson, B. J.; Jorgensen, F. G.; Als, T. D.; Le Hellard, S.; Espeseth, T.; Sullivan, P. F.; Hultman, C. M.; Kjaergaard, P. C.; Schierup, M. H.; Mailund, T. (2016). "Nationwide Genomic Study in Denmark Reveals Remarkable Population Homogeneity". Genetics. 204 (2): 711–722. doi:10.1534/genetics.116.189241. PMC 5068857. PMID 27535931. ^ Channel 4 2004, Episode 3 Britain AD: King Arthur's Britain. ^ Heinrich Härke, 'Anglo-Saxon Immigration and Ethnogenesis', Medieval Archaeology, 55 (2011), 1–28. ^ The archaeology of black Britain, Channel 4. Retrieved 21 December 2009. ^ Wise, Gildas the (1899). "Gildas, The Ruin of Britain &c". Tertullian.org. pp. 4–252. Retrieved 2017-08-21. ^ Oppenheimer, S. (2006). The Origins of the British: A Genetic Detective Story. London: Constable and Robinson. ISBN 978-1-84529-158-7. ^ Britain BC: Life in Britain and Ireland before the Romans by Francis Pryor, p. 122. Harper Perennial. ISBN 0-00-712693-X. ^ Todd, Malcolm. "Anglo-Saxon Origins: The Reality of the Myth", in Cameron, Keith. The nation: myth or reality?. Intellect Books, 1994. Retrieved 21 December 2009. ^ Capelli, C., N. Redhead, J. K. Abernethy, F. Gratrix, J. F. Wilson, T. Moen, T. Hervig, M. Richards, M. P.H. Stumpf, P. A. Underhill, P. Bradshaw, A. Shaha, M. G. Thomas, N. Bradman and D. B. Goldstein A Y Chromosome Census of the British Isles Current Biology, 13 (2003). ^ Rincon, Paul (2016-01-19). "English DNA 'one-third' Anglo-Saxon - BBC News". Retrieved 2016-02-17. ^ Cite error: The named reference Schiffels nature was invoked but never defined (see the help page). ^ Online Etymology Dictionary by Douglas Harper (2001), List of sources used. Retrieved 10 July 2006. ^ "Athelstan (c.895–939) : Historic Figures". Bbc.co.uk. Retrieved 30 October 2006. ^ The Battle of Brunanburh, 937AD by h2g2, BBC website. Retrieved 30 October 2006. ^ OED, 2nd edition, s.v. 'English'. ^ "England—Plantagenet Kings". Heritage History. Archived from the original on 16 December 2010. ^ "BBC - History - British History in depth: The Ages of English". Bbc.co.uk. Retrieved 2017-08-21. ^ "Liberation of Ireland". Iol.ie. Retrieved 23 June 2006. ^ A History of Britain: The British Wars 1603–1776 by Simon Schama, BBC Worldwide. ISBN 0-563-53747-7. ^ "EJP - In Depth - On Anglo Jewry". 14 July 2006. Archived from the original on 14 July 2006. Retrieved 21 August 2017. ^ More Britons applying for Irish passports, Owen Bowcott, The Guardian, 13 September 2006. Retrieved 9 January 2006. ^ a b Black Presence, Asian and Black History in Britain, 1500–1850: UK government website. Retrieved 21 July 2006. ^ "Ethnic minorities more likely to feel British than white people, says research". Evening Standard. 18 February 2007. Archived from the original on 11 February 2010. Retrieved 18 September 2010. ^ a b "British identity: Waning". The Economist. 25 January 2007. Retrieved 9 February 2011. ^ "When British isn't always best". The Guardian. London. 24 January 2007. Retrieved 9 February 2011. ^ Jones, Richard Wyn; Lodge, Guy; Jeffery, Charlie; Gottfried, Glenn; Scully, Roger; Henderson, Ailsa; Wincott, Daniel (July 2013). England and its Two Unions: The Anatomy of a Nation and its Discontents (PDF). Institute for Public Policy Research. Archived from the original (PDF) on 7 November 2014. Retrieved 7 November 2014. ^ Kumar 2003, p. 262. ^ Hoyle, Ben (8 June 2006). "St George unfurls his flag (made in China) once again". The Times. London. Retrieved 10 February 2011. ^ "The West Lothian Question". BBC News. 1 June 1998. Retrieved 9 February 2011. ^ "Fresh call for English Parliament". BBC News. 24 October 2006. Retrieved 9 February 2011. ^ "Welsh nod for English Parliament". BBC News. 20 December 2006. Retrieved 9 February 2011. ^ Curtice, John (February 2010). "Is an English backlash emerging? Reactions to devolution ten years on" (PDF). Institute for Public Policy Research. p. 3. ^ Kenny, Michael; English, Richard; Hayton, Richard (February 2008). "Beyond the constitution? Englishness in a post-devolved Britain". Institute for Public Policy Research. p. 3. ^ Condor, Gibson & Abell 2006, p. 128. ^ Hazell, Robert (2006). "The English Question". Publius. 36 (1): 37–56. doi:10.1093/publius/pjj012. ^ Ormston, Rachel; Curtice, John (December 2010). "Resentment or contentment? Attitudes towards the Union ten years on" (PDF). National Centre for Social Research. Archived from the original (PDF) on 19 April 2011. Retrieved 9 February 2011. ^ "'Most' support English parliament". BBC. 16 January 2007. Retrieved 9 February 2011. ^ Kumar 2010, p. 484. ^ Copus, Colin (2009). "English national parties in post-devolution UK". British Politics. 4 (3): 363–385. doi:10.1057/bp.2009.12. ^ "Full England scoreboard". Election 2010. BBC News. Retrieved 9 February 2011. ^ Kumar 2010, p. 478. ^ "2013 Census – Major ethnic groups in New Zealand". stats.govt.nz. 29 January 2015. Retrieved 11 January 2016. ^ Country of Birth: Proportion Born in Wales Falling, National Statistics, 8 January 2004. 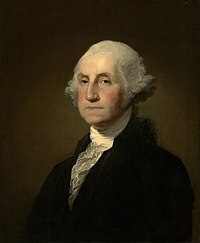 ^ Internet Archive: Details: An examination of the English ancestry of George Washington, setting forth the evidence to connect him with the Washingtons of Sulgrave and Brington. archive.org. Boston, Printed for the New England historic genealogical society. 1889. ^ US Census 2000 data, table PHC-T-43. ^ "Table 2: Persons Who Reported at Least One Specific Ancestry Group for the United States: 1980" (PDF). 1980 United States Census. ^ "Ethnic Origin". 2001 Census. Statistics Canada. 4 November 2002. ^ According to Canada's Ethnocultural Mosaic, 2006 Census, (p.7) "...the presence of the Canadian example has led to an increase in Canadian being reported and has had an impact on the counts of other groups, especially for French, English, Irish and Scottish. People who previously reported these origins in the census had the tendency to now report Canadian." ^ Statistics, c=AU; o=Commonwealth of Australia; ou=Australian Bureau of (2003-06-03). "Chapter - Population characteristics: Ancestry of Australia's population". Abs.gov.au. Retrieved 21 August 2017. ^ "Census 2016: Summary of result – Population by states and territories, 2011 and 2016 Census". Australian Bureau of Statistics. Australian Government. ^ Gledhill, Ruth (15 February 2007). "Catholics set to pass Anglicans as leading UK church". The Times. London. Archived from the original on 18 September 2011. Retrieved 18 February 2015. ^ "How many Catholics are there in Britain?". BBC. London. 15 September 2010. Retrieved 18 February 2015. ^ "2009 Church Statistics" (PDF). Church of England. 2009. ^ See the pages linked from "Life Events". Church of England. .
^ Bowler, Peter J. (2001). Reconciling science and religion: the debate in early-twentieth-century Britain. Chicago: University of Chicago Press. p. 194. .
^ "Facts and Stats". Church of England. ^ "Research and Statistics". Church of England. Retrieved 9 May 2012. . Expert Links: English Family History and Genealogy Useful for tracking down historical inhabitants of England. Condor, Susan; Gibson, Stephen; Abell, Jackie (2006). "English identity and ethnic diversity in the context of UK constitutional change" (PDF). Ethnicities. 6 (2): 123–158. doi:10.1177/1468796806063748. Archived from the original (PDF) on 21 September 2011. Kate Fox (2004). Watching the English. Hodder & Stoughton. ISBN 978-0-340-81886-2. Kumar, Krishan (2003). The Making of English National Identity. Cambridge University Press. ISBN 978-0-521-77736-0. Kumar, Krishan (2010). "Negotiating English identity: Englishness, Britishness and the future of the United Kingdom". Nations and Nationalism. 16 (3): 469–487. doi:10.1111/j.1469-8129.2010.00442.x. Paxman, Jeremy (1999). The English. Penguin Books Ltd. ISBN 978-0-14-026723-5. Robert J.C. Young (2008). The Idea of English Ethnicity. Blackwell Publishers. ISBN 978-1-4051-0129-5. Bueltmann, Tanja, David T. Gleeson, and Donald M. MacRaild, eds. Locating the English Diaspora, 1500–2010 (Liverpool University Press, 2012) 246 pp. ^ A sample of this discussion can be seen on the television series Britain AD: King Arthur's Britain, particularly the discussion between Francis Pryor and Heinrich Härke. ^ Year the official census was taken. ^ 215,589 listed their birthplace as England. Mercator's Atlas Map of England ("Anglia") circa 1564. Viking blood still flowing; BBC; 3 December 2001. UK 2001 Census showing 49,138,831 people from all ethnic groups living in England. Tory MP leads English protest over census; The Telegraph; 23 April 2001. On St. George's Day, What's Become Of England? ; CNSNews.com; 23 April 2001. Watching the English – an anthropologist's look at the hidden rules of English behaviour. The True-Born Englishman, by Daniel Defoe. BBC "English and Welsh are races apart"